There are some amazing slot games to be played online and a great range of Casinos to choose from. While slot lovers really enjoy playing the newest slot versions, they still have a great deal of respect for the classics, and one of the slot that fits into this category is Gold Slam. Although this may be a classic, it has a very modern and up to date look and feel to it. It is provided through Sheriff Gaming. 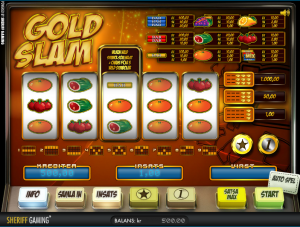 Gold Slam is a 5 reel 9 pay line slot. To begin your play the first thing you need to do is determine your bet. This can range from.10 cent up to $25. You only have the option of placing one coin per line bet which means this slot doesn’t add level up opportunities. This however keeps it simple, and depending on your nerves at the moment you can decide it to be really daring with a max. bet or be really conservative with a 10 cent bet until you get the feel of the slot. A s you will see the symbols are comprised of a variety of fruits but there are also some gold bars mixed in with these icons and as the name suggests it’s the gold that you really want to line up. Should you come out the Jackpot winner of Gold Slam then you will do so with $25,000 in your pocket. If you are adamant on playing a slot with a free spins feature, then you are out of luck with this on the Gold Slam. However, there are some other perks that come with this game that just might make up for the lack of free spins. Your focus when playing Gold Slam should be to go after the wild and the Gold 7. One of the features on this game that boosts your chance for a good win is the nudge feature. If you land either one or two wilds on the third reel, the reel can get nudged up or down by one or two positions. When this happens 3 extra wilds can show up which will replace the existing symbols, thereby increasing your chance for a great win. Another feature that steps up the level of excitement is when you win you get a chance to double your win up to 10x. This also puts you in a position where you could lose your win too. However, this added feature keeps slot playing super interesting.